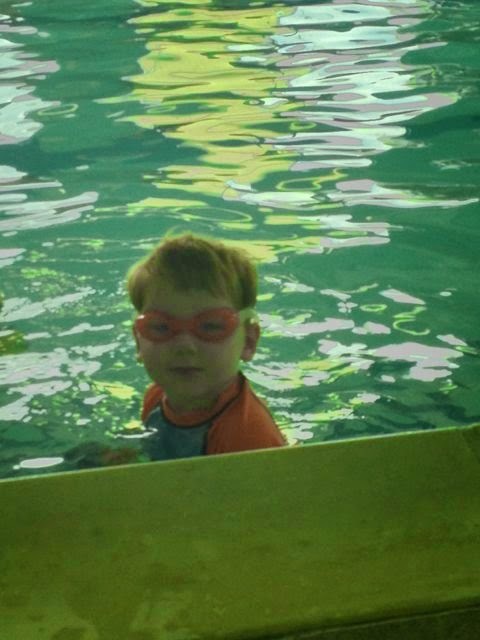 Last week, a friend called to let me know the place where her son has swim lessons was having a special day where he could bring a friend to join him, and wanted to see if I would be interested in letting Ollie join. A Free swim lesson? Yes, please! I've heard horror stories of toddler meltdowns at the first lesson. Heck yeah, I want a free test run..
On the morning of the lesson, I showed Ollie toddlers taking swim lessons on YouTube, then spent the rest of the morning talking it up big time. I made it sound like he was going to the party of the century, and he was gonna LOVE it. It worked! Because he did LOVE it. I walked him over to the side of the pool to where his teacher was already in the water sitting on the steps with his friend. She said it was best if I just handed him over to her, so she could walk him around inside the pool to get acclimated. Even though this was my first toddler rodeo at the pool, this was not hers, so even though he was apprehensive and clinging to me, I handed him over... He was not pleased. I told myself before we went that if he got hysterical, I wasn't going to push him. No way was I going to traumatize him on his first trip to a "real" pool. Even though he was upset and crying when I handed him over, it was about a 4 on the scale of 1-10, with a 10 being traumatizing screaming. His teacher carried him over to a basket of toys and gave him a little turtle to squeeze and play with. Thankfully, he stopped crying and calmed down within a couple of seconds of the turtle being handed over. 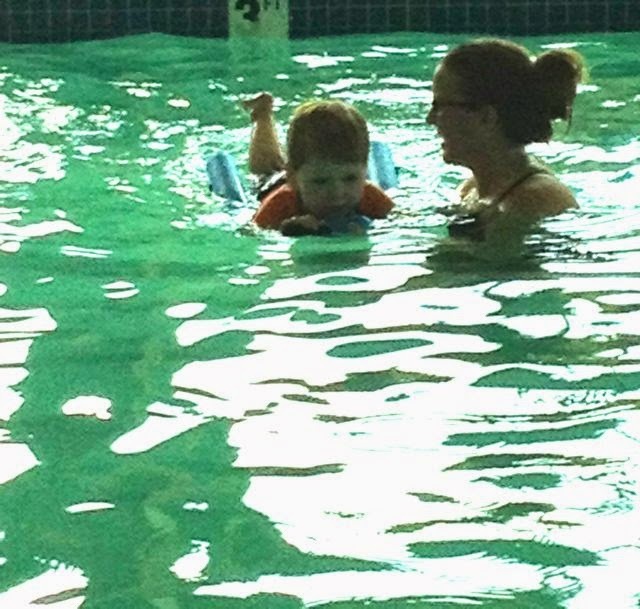 Tear-free, he let his teacher carry him all over the pool, and then back to me at the steps. I nearly passed out when she sat him down on the step and told him to stay there seated, and HE DID! 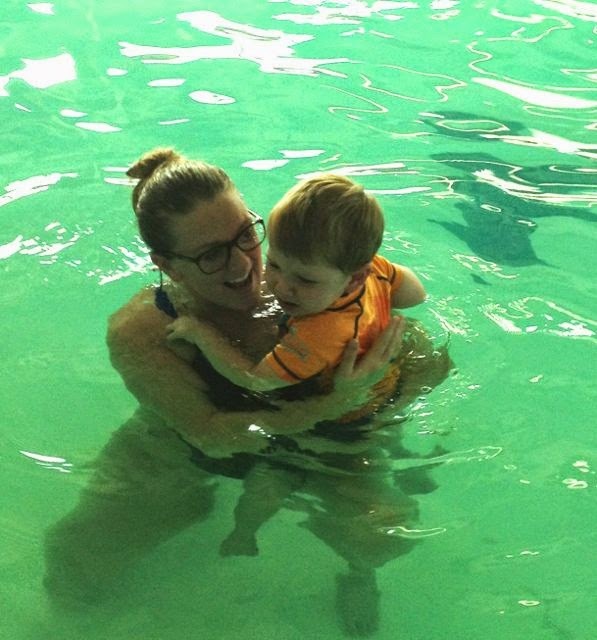 I was sure the second his teacher let him go he would climb out of the pool, and run to the safety of my arms. He was really enjoying himself! She came back to him with a little swimming contraption he could lay on to stay floating, but also kick freely. Sure enough, he climbed right on and was off kicking away. I was so proud of my big brave boy. Over the next half hour she alternated between Ollie, his friend and another little boy. The teacher was wonderful, and even though all three boys were at different levels with swimming, she was able to work with each one and keep the other two interested. The lesson was a HUGE success. We are definitely going back. In fact, Ollie was ready to get back in the pool after the lesson was over, and has not stopped asking to go back since leaving. 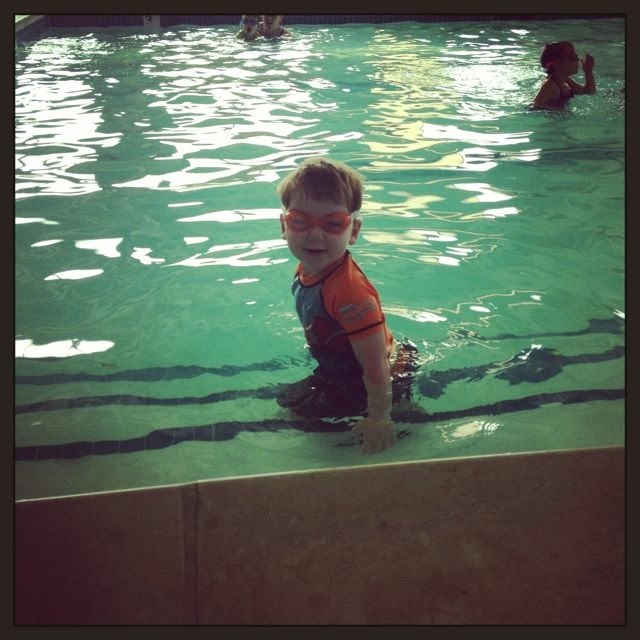 I think learning to swim is such an important life lesson. Swimming is not only a fun thing to know how to do, it could save his life. I had every intention of getting him lessons next spring, but after seeing how much he loved it, I'm going to start him in lessons now. Plus, it will give us something fun to do to get our minds off of being stuck inside during the long cold winter months. In other related news... Ollie was not the only person who learned a lesson, I did too. You see how grainy and crappy those pictures are? It's because I have come to depend on my camera phone for capturing moments, when really, it doesn't capture them so well. This camera fail has made me realize that moving forward, I will bring a REAL camera to all of Ollie's big firsts and events. Because these are big moments that I need to captured and saved forever, not just let them get lost in the shuffle of 4000 iPhone photos. it's the last of the summer of 2014!